Taking a break from his street corner, a young man named Andrew opened a box of take-out breakfast a motorist gave him. He peeked in warily. A few stale bits of egg, a soggy piece of toast, a couple sausages. “I'm not that hungry yet,” he said. Andrew, 22, said he had been panhandling at this Grand Rapids corner for about a month. Unlike many panhandlers, he had his own car, a 1993 Mercury Sable with just over 175,000 miles. And a girlfriend who was expecting a baby by the end of the year. He asked that his face not be shown in a photo. He said he and his girlfriend were trying to save enough money to get their own apartment. For now, they stayed in a nearby motel which cost about $30 a day. Andrew said he has been out on his own since about age 14, when he left a troubled home and dropped out of school. He crashed with friends, shared a house or apartment, and performed all kinds of odd jobs to make ends meet. He ticked off a list, including maintenance, landscaping, construction, painting, even the odd job fixing someone's computer. Along the way, he earned his GED. He moved out west about two years ago to take a job doing maintenance work. He recently did a 10-day stint renovating a small discount store in the Grand Rapids area. “I pretty much always worked,” he said. Andrew said he resents news reports on panhandling that focus on drug addicts or alcoholics, who put their donations toward booze or drugs. He is aware that many cities in the Grand Rapids area ban what he is doing. He fully expects Grand Rapids to adopt a similar ban soon. Like any panhandler, said he's had his share of unpleasant encounters. A few minutes later, stopped at the light, a woman in a Volvo station wagon handed him four dollars through the window. “There are good people,” Andrew said. Yes, panhandlers make people feel uncomfortable and perhaps a little unsafe. The young man somehow expects a motorist to differentiate between him and an alcoholic. We can't. That's the point of donating to a real charity they do it for you. If they are going to ban panhandlers though they should also ban the service organizations who stand right out in the middle of the street and dip and dodge through traffic. Frankly, what I am really tired of is being asked for $1 to support some charity or another every time I go to a store or drive through. It's not novel anymore. I don't know where the money is really going or whether the store is keeping a percentage for overhead or taking a tax deduction for my money. That's panhandling too. 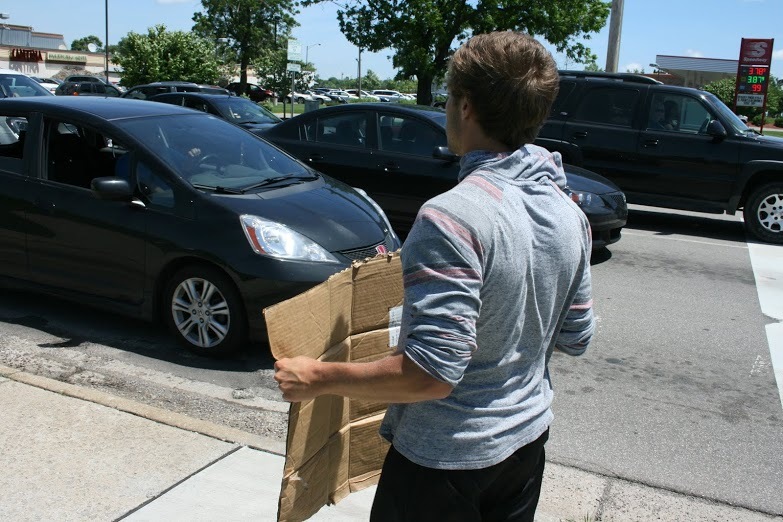 People often see panhandlers as an affront to their middle class values and have a problem with that. In a related area back in my younger days I used to collect returnable cans and bottles when I rode my bike out in the country, I had a full time job and didn't need the money but I couldn't resist 10 cents lying on the side of the road and I was glad to take it plus it helped the environment as well. Seeing someone with plastic bags full of returnables hanging on their bike handlebars brought out some bad reactions from people but I just thought to myself why don't you just mind you own business? $5 to $10 a day was not uncommon (I rode a lot of miles out in the country). Since the economy in Michigan went south years ago the number of returnables on the side of the road is way way down, people don't casually throw away 10 cents like they used to. I grew up in the Detroit area with two parents who worked HARD and ALL THE TIME. By the time I was 12, I was the full-time caregiver for my 3 younger siblings when my parents were working. My father drove 55 miles each way to work, and would always add in extra time to his commute to pick up the bottles and cans on the road for that 10 cent deposit. We paid for a vacation that way. We paid for some small luxuries that way (by luxuries, I mean a basketball hoop on our house to keep the kids at home, or bikes for us to ride to the store.) The income my parents had back then was barely enough to feed 4 kids. Now, it's not even possible without some help. I currently live in an area where people panhandle for fun/hippie lifestyle, but the majority of truly homeless are honestly struggling. It says a lot about this world when people with only a HS education can't get by, and have to live in their cars. We need more compassion for our fellow human beings. Just another attack on the poor. Stop the lobbyist panhandling in DC. Well said. I haven't been bothered and I'm glad they make people uncomfortable. Regardless of their circumstances, they remind us of others that have not had the same luck and advantages whether it's employment, health or family resources. The wealthy are the real panhandlers with their corporate subsidizes, tax havens and inheritance. (I am no relation to the article author). I have volunteered at homeless meals and currently volunteer doing home repairs for mostly low income people. I have compassion for those who are struggling in life financially due to illness, disability, etc. Especially in the rural areas it can be very difficult to find any employment. But I don't know what to make of this 22 year old able young man living in GR. He apparently does not have a condition that prevents him from working. (he gave a list of several physically demanding jobs he has held). No mention is made of drug or alcohol problems, nor mental illness issues. Older people certainly have an obstacle getting hired. But a robust 22 year old? The interviewer should have asked what jobs he has applied for in the GR area. Even an entry level position as a restaurant server or shelf stocker would help get him going in life. If all he can get is a part-time job, then he needs two part-time jobs. A healthy 22 year old should be able to handle it. If he wants to get a landlord to rent him a room, he really needs to have a job. NO ONE will rent to him without a source of income! At $30 per day he is paying for a motel, that is $900/month rent equivalent! 14 years old is way too young for most people to get out in the world on their own. It sounds like he did not get the nurturing and instruction he should have had as a youngster. He needs someone to come along side him and give him some good advice.